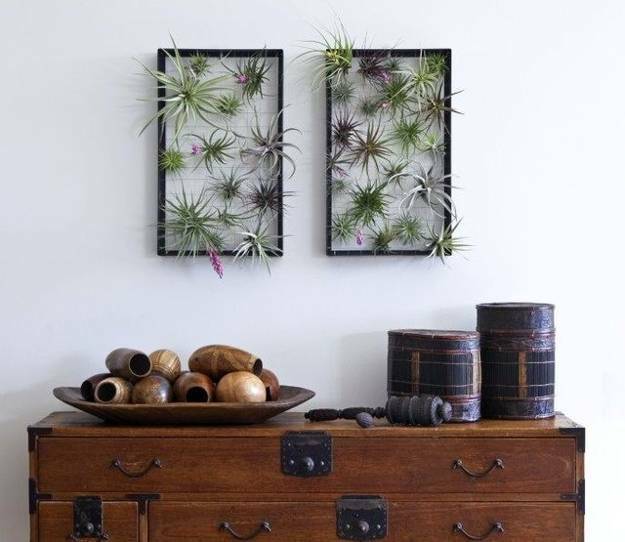 A wooden frame, combined with small house plants, like air plants, makes a modern wall decoration. Wooden frames are traditional decor accessories that are used for interior decorating with photographs, maps and crafts. 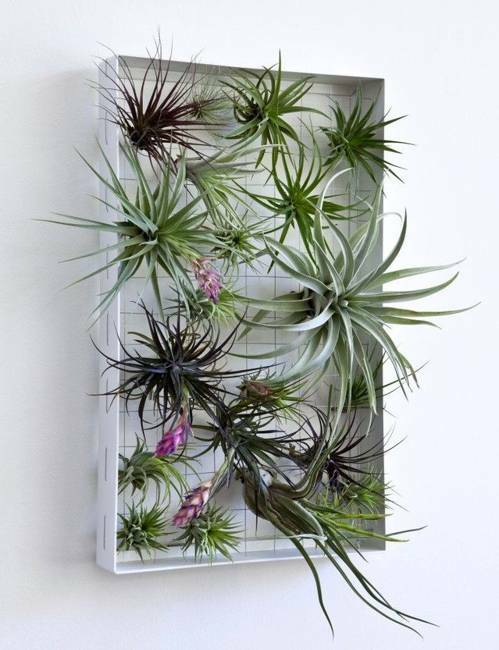 Lushome presents a creative Green wall decoration and vertical garden design idea that may inspire DIY projects for Green interior decorating or home staging with air plants. Tillandsias are attractive air plants from tropical forests that grow differently than most other house plants. 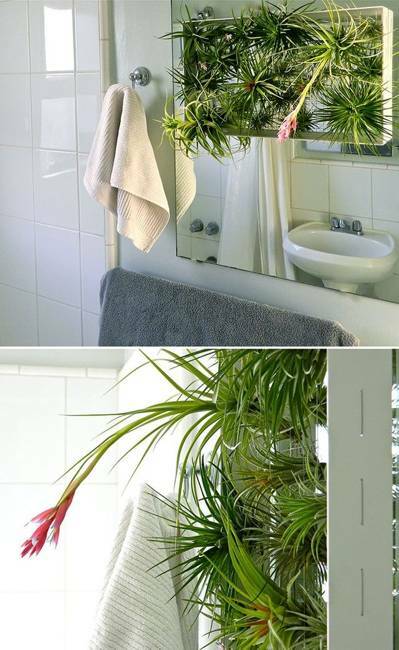 These amazing house plants take water from the air and offer great ideas for modern bathroom decorating in eco style. These house plants are really very hardy, and require much less attention than other house plants. 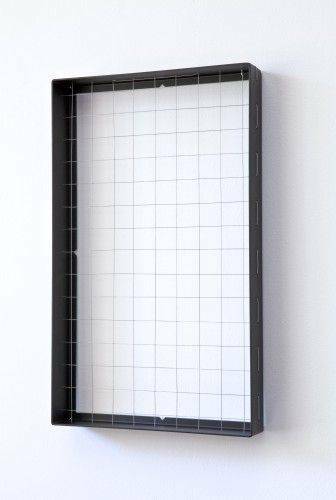 They are ideal for space saving vertical garden design and modern bathroom decorating. This wooden frame for vertical garden design can be built of wood and painted any color that matches existing interior design and decor. The Green wall decoration looks simple and inspiring, and will add a stylish vibe to any room design. Live Green wall decorations, vertical gardens and house plants are beautiful trends in decorating in eco style. Vertical garden design ideas transform modern interiors and outdoor living spaces, bringing the nature into rooms, balcony decorating and adding unique Green accents to patio ideas. Suspended containers with house plants and vertical garden design ideas are excellent for creating fresh and interesting interior design or beautify home staging, including rooms and outdoor living spaces. Vertical garden design is one of stylish, interesting and attractive ways of Green wall decoration. Vertical garden design ideas include plants that do not need the soil. These kinds of house plants get moisture out of the air, making wall decoration simple, light and easy. Air plants from tropical rainforests can survive by getting water from the air. High humidity and heat provide excellent conditions for growing these house plants which are ideal for modern bathroom decorating. 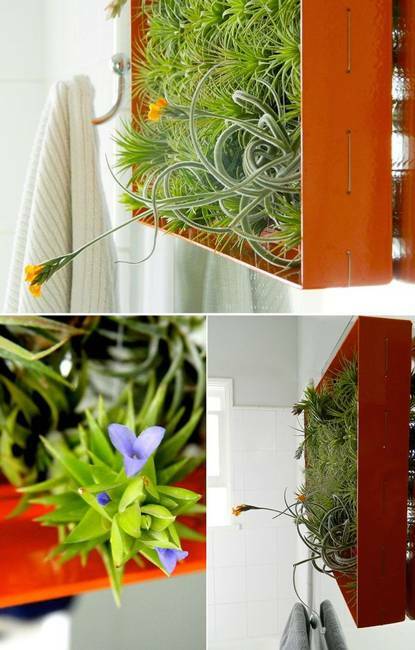 The air plants create a fabulous vertical garden design and offer spectacular, unusual and Green wall decoration in eco style for a large or small modern bathroom. There are air plants that can be used for living room or bedroom designs. These house plants need just a bright place without direct sunlight and create gorgeous Green wall decoration that connect interior design with the nature. These house plants should be regularly sprayed, sometimes a few times a day. It keeps them look healthy and beautiful. Air plants are beautiful small house plants for creating live compositions for Green wall decoration. Wooden or plastic frames with metal wire or line mesh are creative, contemporary and impressive vertical garden design ideas.